Our range of products include goliath crane. 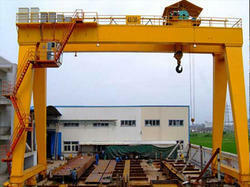 These types of cranes are generally used in outdoor to handle heavy loads. In the Engineering industries, Ship Yards, Ports, Granite and Marble cutting and polishing Industries, Open yard Storage Places, Container Depute etc. These cranes are consist of same as per double grider or single girder type EOT Cranes but these cranes are run on floor mounted rail by its two legs which is fabricated from rolled steel sections or from plate which is suitable in design and costing.